Make your purchase below to get your gift certificate for Canadian Wine right now! 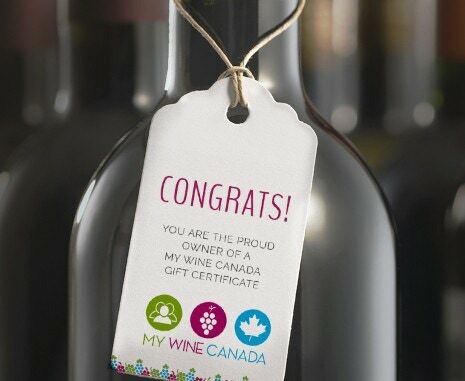 Purchase My Wine Canada gift certificates for any amount you like, and you will receive your personalized certificate via email. This certificate is redeemable on the website for any of our fantastic winery partners! Looking for a birthday or holiday gift for the wine-lover in your life? Look no further – with premium wine available from dozens of wineries, you’re sure to please even the most discerning oenophile. The gift of wine is also a great way to butter up colleagues or business partners, instantly providing them with access to hundreds of Canadian wines from across the country. Purchase in any denomination and add a personalized message to the recipient. Or send it to yourself as a reminder of your own thoughtfulness. Check out the snazzy sample to the right to see how your gift certificate will look! Thank you for sharing the wine love!